This pumpkin pita is one of the specialties of the island of Samos, a beautiful island in the eastern part the Aegean Sea. It’s a savory pumpkin and phyllo pie that combines sweet pumpkin with onions, feta cheese, and mint. 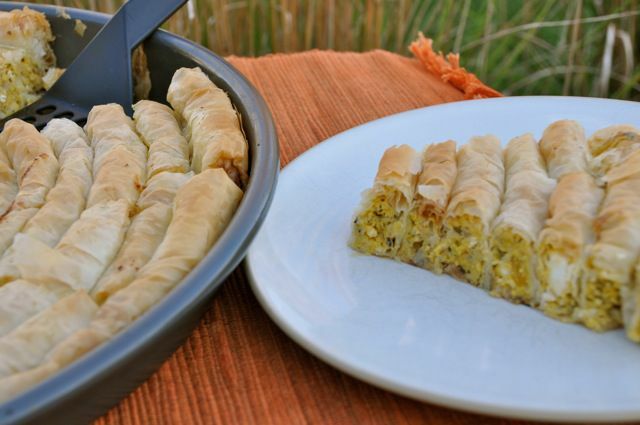 Baked until the phyllo is crisp and golden brown, it makes a wonderful appetizer, side dish or light meal. This pumpkin pita is traditionally made using a distinctive coiled design, but you can simplify the recipe by preparing the filling and folding it into traditional phyllo triangles or by making a layered pita in a pan. Clean out the pumpkin seeds, slice into wedges and roast on a sheet pan in a preheated 400 F oven for about 45 minutes. Allow the pumpkin to cool slightly and then remove the skin with a sharp knife. Cube the pumpkin flesh and place in a food mill or food processor to puree. Strain the pumpkin puree for about 15 minutes in a strainer lined with cheesecloth to extract most of the water. In a large skillet or frying pan, heat 2 tablespoons of olive oil over medium-high heat. Sauté the onion until it is soft and translucent, about 8 minutes. Remove from heat and set aside to cool. In a medium bowl, combine the pumpkin puree with the crumbled feta, eggs, mint, bulgur wheat (rice) and season to taste with salt and freshly ground black pepper. Add the cooled onions and mix well. Lightly grease the bottom and sides of a 14-inch round pan with olive oil. Remove the phyllo from the package and carefully unroll the sheets. Remove a single sheet from the stack and cover the remaining sheets with a clean towel. Place the sheet of phyllo horizontally (landscape position) in front of you. Brush the sheet well with olive oil. Fold the sheet in half horizontally toward the top edge (the folded edge will be closest to you) and brush again with olive oil. Leaving about an inch margin on the sides and bottom of the phyllo sheet, place a thin line of filling (about 2 1/2 tablespoons) along the bottom edge. Fold the sides in and begin to roll the bottom edge up as if to make a tube. The tube should be approximately an inch in diameter. The key to a smooth roll is to brush the phyllo log with olive oil as you are rolling it upwards. That way the underside of the phyllo will also be moistened with the oil and it will be more pliable. Beginning at the outer edges of the pan, place the tubes with their seam side down along the perimeter of the pan. Keep laying coils in a tight circle pattern while working your way in toward the center. Continue rolling until the pan is filled. Bake the pita in a 350 F oven for 50 minutes or until the phyllo is a nice golden brown color. If using fresh pumpkin, roasting the pumpkin produces the sweetest results. A pound of fresh pumpkin will yield about a cup of puree.